These oriental poppy seeds came from two different poppies in my garden that make a beautiful combination. One has watermelon-pink flowers, and the other is a pretty shade of deep apricot-pink. Of course, they may have crossed in the garden, so there could other shades in between. 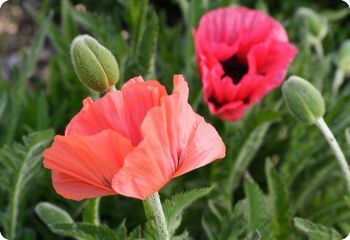 Papaver orientale blooms in early summer. The large flowers look wonderful with bearded iris and Hesperis matronalis Alba. Deer resistant. Hardy perennial in zones 3-9. Start oriental poppy seeds indoors 8 weeks before the last frost date. Sow on the surface. Full sun.